Try the new interactive live video feature and enjoy this live comedy show where you get to be the judge, only on the Insider.in app! 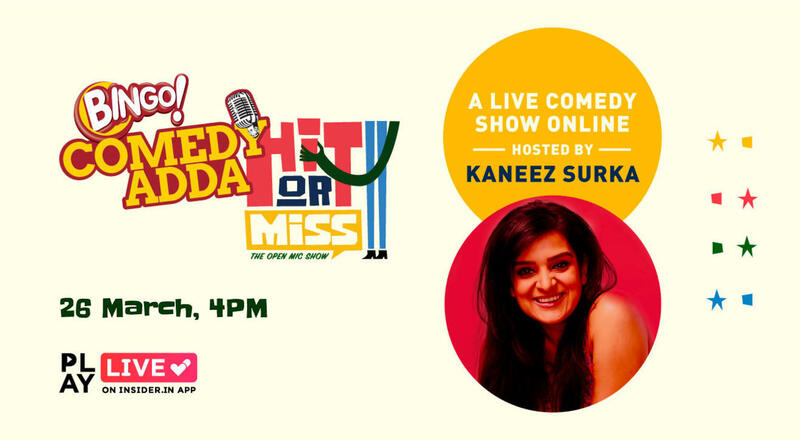 Tune in to Bingo Comedy Adda: Hit or Miss and watch three standup comedians go head to head in this first of its kind free live event. Doesn’t end there though - you also get to decide the winner by voting for the comics. And the participant who gets the most laughs walks away with a ridiculously large cheque! The haha-est scorer at the end of the show will be rewarded Rs. 10,000! 1. How does this online show work? Hit or Miss is an online comedy show where the performance of each comic is judged by you, and everybody else online on the app at that time. It’s 15 minutes of jokes, and punchlines which may leave you hmm-ing or thinking ‘Bingo! That was awesome!’ You’ve to rate each performance using the reaction buttons on the app and at the end of performances, Insider.in does some quick math to announce the winner, who takes home a giant cheque from Insider.in. 2. How do I watch? Get started by downloading the app from the Google Play Store or the App Store, or if you have the Insider.in app already, update it to have the latest version. You will see the ‘Play it Live’ section on the home page. This is where you can see all the online shows coming up! Click on any of the shows and then for whichever you like, click on the ‘Follow’ button to get notified when the show is starting on the app. Join the show on time to make sure you don’t miss out on any performances! 3. I logged in late! What's going on? If you logged in late, fikar not! You might have missed some parts of the show. But, you can view the remaining performances and vote on those. 4. Which version of the app do I need to join the online game shows? 4: I'm facing a technical issue. Who do I reach out to? If you face any kind of a glitch during the show, please go back to the homepage and try to join us again. If that doesn’t help shoot us a mail at help@insider.in with your device details and our customer experience crew will help you out. 5. Which other shows are on? If movies are your jam, join these quiz shows with these fabulous hosts, and win rewards that you can apply on the app to buy events and movie tickets! We’re adding new stuff every week! Make sure you keep checking in to see what’s on. The live feature is available exclusively on the Insider.in app. Click below to get started.